I found this story to be quite intriguing. It drew me into this world of violence and showed the allure of hooliganism without glorifying it. People have such a strong craving for acceptance and community. Not only do we want to know that someone "has our back" we want to feel the importance of guarding someone else's back. We want to feel like we matter to someone other than ourselves. Of course, this often runs contrary to our natural selfishness. Reflecting on this movie, I am reminded of a book by Philip Yancey called What's So Amazing About Grace. The main idea of the book, as I remember it, is that the only thing that can interrupt endless cycles of fear, anger, and violence is grace. In a way, this movie demonstrates the same principle of sacrifice that Christ did. I don't want to give anything away, but ultimately, someone must pay the price for the cycle of violence that defines the lives of these football hooligans. This movie definitely earns its "R" rating for brutal violence and pervasive language, so it's not for the squeamish. (Of course, it's not always easy to understand the thick British accents unless you have subtitles on!) 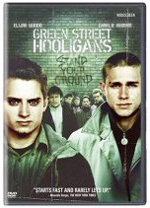 I recommend it, however, for its honest portrayal of an intriguing subculture that has an impact on many parts of the world. I gave it 4 stars out of 5.